This attractive hotel enjoys a superb location directly on the coast of the Adriatic, only a few steps from the beach. Surrounding the hotel are five national and two wildlife parks. The famous victory memorials can be reached by car in one hour, and the nearest public transport stop can easily be reached on foot. The hotel comprises a total of 340 rooms over four floors. Facilities on offer include Internet access, a hairdresser, a cosy bar, and a welcoming restaurant serving delicious cuisine. Parking spaces are available for those arriving by car. The tastefully fitted rooms all come with bathroom and hairdryer, a direct dial telephone, an Internet connection, and central heating. A swimming pool is available in the outdoor complex. Guests can also relax on the sun terrace or enjoy a game of tennis. Breakfast may be selected from a buffet each morning. When you stay at Crvena Luka Apartments and Villas in Biograd na Moru, you'll be on the waterfront and 14 minutes by car from Vransko Lake Nature Park. This 4-star resort is 4.7 mi (7.5 km) from Marina Kornati and 6.1 mi (9.8 km) from Lake Vrana. Located in Biograd na Moru, Hotel Bolero is within a 15-minute drive of Marina Kornati and Vransko Lake Nature Park. This hotel is 4.5 mi (7.3 km) from Island of Love and 7.3 mi (11.8 km) from Lake Vrana. Enjoy a satisfying meal at Mareta serving guests of Hotel Hygge. Quench your thirst with your favorite drink at the bar/lounge. A complimentary buffet breakfast is served daily. With a stay at Ante in Biograd na Moru, you'll be within a 15-minute drive of Marina Kornati and Vransko Lake Nature Park. 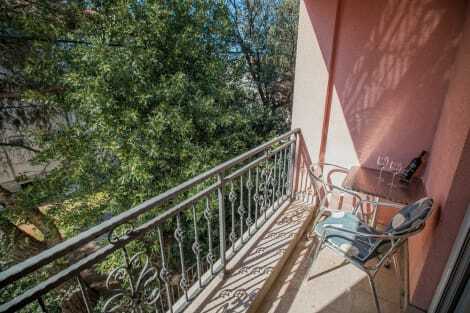 This apartment is 4.7 mi (7.6 km) from Island of Love and 7.8 mi (12.5 km) from Lake Vrana. Be sure to enjoy recreational amenities, including an indoor pool, a spa tub, and a fitness center. Additional features at this hotel include complimentary wireless Internet access, wedding services, and tour/ticket assistance. Only 50m from the beach and named after the nearby archipelago, this hotel combines the serene maritime design theme with all the necessary amenities for a memorable family holiday. It is located in the centre of the town of Biograd and boasts its own marina for visitors, arriving by boat. Alternatively, guests can rent a vessel or go on an organised boat trip. Inside, the rooms are just as blue, peaceful and beautiful as the amazing views of the islands and the marina from the windows. The hotel's beach has a bar where holidaymakers can relax and enjoy the sun and the breeze. The more active tourists can try a range of activities like tennis, cycling, horseback riding or hiking within minutes from the hotel. 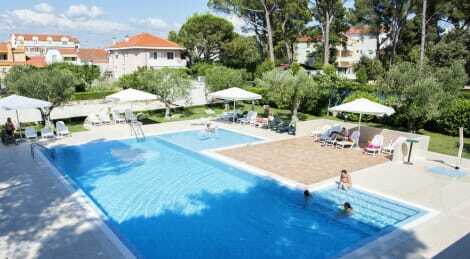 This designer hotel on the Croatian coast, situated only 20 metres from the beach in Biograd na Moru, offers guests spectacular views from each room. They can also stay connected with the complimentary WiFi access available throughout the hotel. Guests can opt to plunge into the swimming pool or suntan on the blue-flag pebbly, sandy and concrete beach. This establishment also houses a modern-style à la carte restaurant that serves tasty local dishes like Dalmatian "pašticada" with gnocchi and an excellent choice of wine. Business travellers can also utilize the conference facilities. Sports enthusiasts can try their hand rock climbing or go scuba diving, amongst other many activities that this hotel has to offer. Make yourself at home in one of the 67 air-conditioned rooms featuring minibars. Complimentary wireless Internet access keeps you connected, and satellite programming is available for your entertainment. Bathrooms have bathtubs or showers and hair dryers. Conveniences include phones, and cribs/infant beds (surcharge) can be requested. lastminute.com has a fantastic range of hotels in Biograd na Moru, with everything from cheap hotels to luxurious five star accommodation available. We like to live up to our last minute name so remember you can book any one of our excellent Biograd na Moru hotels up until midnight and stay the same night.